This is a track I created some months ago. I have spent a very long time experimenting with the mix, equalization, effects and the like. I think there’s still a lot of room for improvement, but it sounds much better than it did at first. As usual, let me know what you think, either by commenting here or on Soundcloud. This post has been originally written for the Headshift Labs blog and is posted here with permission. Not many days ago, a user exploiting a Ruby on Rails vulnerability on Github gave rise to a big turmoil in the developer community. Let’s look into it a bit more. Feel free to skip this section if you already know what the issue is and who is involved. If you are not familiar with Rails or Github, it’s worth unraveling this tangled bit first: Github is home to many open source projects. Among those projects, Github is hosting the Ruby on Rails project (source code, discussions, bug tracking and so on). Ruby on Rails (Rails in short) is a framework to create web applications. Github is built with Rails. This is why Github is the centre of this story: on one side, a vulnerability in Rails makes it vulnerable too. On the other side, discussions about Rails vulnerabilities happen on Github. Attributes mass-assignment is a feature in Rails. Assuming you have a User with name, surname and role attributes, you could set them all by passing a parameter to a single call. This is very handy for web forms: you can pass the form contents (let’s say name and surname) to the User and set all attributes in one fell swoop. The problem is, a malicious user may submit the form after adding any field to it, thus setting an attribute that was considered protected (e.g. role=admin). Pretty bad. The two basic approaches to solving this are a blacklist and a whitelist. With a blacklist, we specify all the attributes we want to protect (e.g. role), thus making mass-assignment impossible for them. Any other attribute won’t be protected. With a whitelist, on the other side, we specify the attributes we don’t want to protect (e.g. name, surname) and everything else is protected by default. In general terms, blacklists are less likely to get in your way when developing, but whitelists are more secure. A white hat hacker is someone who actively looks for security holes and vulnerabilities without a malicious intent. They break security in order to highlight issues that need to be fixed. Here is a brief rundown of what happened. On March 2nd, Egor Homakov posted on the Rails issue tracker, reporting a vulnerability in attributes mass-assignment: issue #5228. Homakov, as a proof of concept, created a new issue with a date 1001 years in the future: issue #5239. (Github later claimed that, at this point, Homakov had responsibly disclosed the vulnerability and they were working to fix it). While responding to Homakov’s initial thread, the Rails team pointed out that what he had reported was a well known vulnerability (already addressed in the Rails security guide), that the issue had already been discussed in the past and the consensus was that it was not to be fixed. In short: the burden of securing the application is down to the developers, not to the framework. On March 5th Homakov upped the ante: he exploited the vulnerability again, only this time to add his public key to the Rails organisation on Github, becoming a project administrator. As a proof of concept, he committed a file to the repo. No harm done, but a powerful show-off: the admins for a repository are more or less all-powerful (they can commit, edit discussions, even destroy the repo). As a consequence, Github suspended his account and posted a rather dry message about the issue. Later on, following some more investigation, Github reinstated Homakov’s account and published a second post, with some deeper insight and a link to their newly drafted Responsible Disclosure policy. In short: white hat hackers are welcome, attackers exploiting vulnerabilities are not. If you haven’t had enough, you can head over to Ars Techica for another take on these facts. The question to ask when you look at security is not whether this makes us safer, but whether it’s worth the trade-off. (See his TED talk or indeed any of his writings for more information on this idea). The Rails devs obviously thought the trade-off should be in favour of making apps easier to write. Indeed, as soon as you add security, you make access more cumbersome. In this case, more boilerplate code to be written and potential headaches when an update fails because an attribute could not be set. On the other hand, experience demonstrates that defaults are important. I believe it wouldn’t be an exaggeration to estimate less than 50% of developers secure their applications thoroughly. Especially in a framework like Rails, which favours convention over configuration. In fact, Rails has indeed resolved other trade-offs in favour of security. A good example is protect_from_forgery (which is enabled by default). Of course, the cost for the developer is much lower in that case, so finding the trade-off is not hard (increasing security by default). All in all, I can totally understand the Rails team’s decision. Whitelisting attributes (or even just blacklisting them) is a lot of work. The prevalence of this vulnerability, however, is making the security cost higher (it is number 4 in the OWASP list of top application security risks for 2010). Especially now that it’s out in the open, I believe Rails core should address it by enforcing security (whitelisting) by default. In the wake of the event, many people (as Homakov himself did) have argued that whitelisting is the only way to go (and that it should be a default). As it is probably clear at this point, I tend to agree. However, I also think this poses a question of coherence: if whitelisting is the right approach, Github cannot be blamed for applying that concept in dealing with the matter. In my opinion, suspending Homakov at the time was akin to whitelisting: the first priority during an attack is to defend against it (thus resulting in the account suspension). Only after that and the subsequent vulnerability mitigation can you reopen what you need to (his account was later reinstated). It’s easy to see he was a white hat, in hindsight. But I don’t believe it would have been possible to make the same call when the attack happened. An attacker gaining admin rights is a deeply scary prospect and this has been a very visible hack. It’s no surprise that apocalyptic scenarios have been painted about the future of projects hosted on Github. My belief, however, is that damage would have been somewhat limited in this case: the way git commits work makes it pretty hard to change past history with no one being the wiser. Also, its distributed nature mitigates the impact of someone deleting the main repository. This won’t prevent an attacker from injecting malicious code in a new commit, but those are usually reviewed by the team before they make it into a new release. All in all, there’s no doubt an attacker maliciously exploiting this vulnerability might have done some harm, but I believe invoking the apocalypse for all projects hosted on Github is mostly empty sensationalism. Note, however, that the situation may be far worse for other vulnerable Rails applications, depending on how they are implemented (which models are vulnerable, what permissions are available to admins and so on). The dust has just started to settle, but it’s never too early to get good lessons out of a situation like this. The first take is: your Rails applications probably need an audit. Put some time aside and make sure you’re not the next developer/company to fail spectacularly because of what is now a well-known vulnerability (with well known countermeasures). The second take is: security is a trade-off. In the wake of the hack, it’s easy to think that we should run and harden applications against all possible attacks. Rest assured that this protection comes with a cost and sometimes the cost is just too high compared to the benefit. An additional point to consider is how Github managed the disclosure of the vulnerability. This can give us a starting point in thinking how companies should listen to the conversations happening on their platforms and what kind of insights they can get out of them. We’ll have a post in the future to look into this in more detail. A fairly common Git workflow – and the one we tend to use at Dachis Group in London – makes use of 3 remote branches: master for development, staging and production to deploy to the staging and production servers. We talked about this workflow in a previous post. The gist of it is: changes are always committed to the master branch. 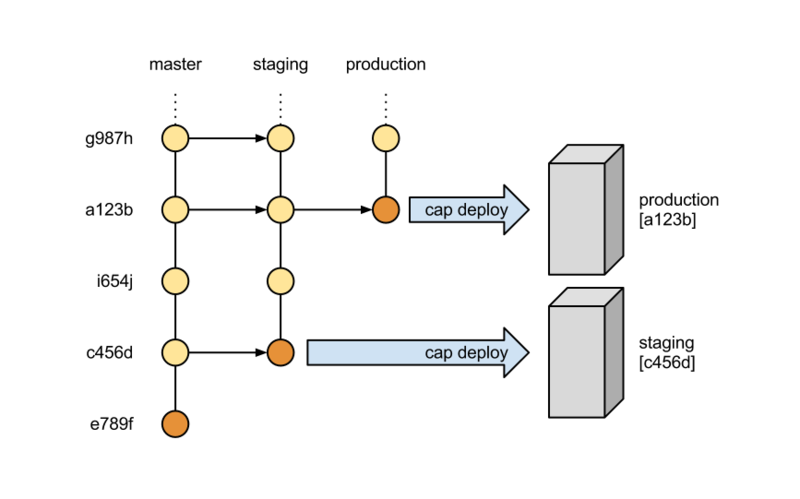 When it’s time for a deploy, they are merged into the deployment branch (let’s say staging), pushed and delivered to the server using Capistrano. When using this workflow, commits should always happen on the master branch. However, swinging from branch to branch can sometimes fool even the best of us into thinking we are committing to master when we are actually still on staging. To put an end to this mild annoyance, I’ve put together a simple Git hook. It’s supposed to work on pre-commit (that is, it runs before you even write your commit message). All it does is make the commit command fail if the current branch is either staging or production. As an aside, it’s worth noting that sometimes you do need to commit to a deployment branch: hotfixes are a case where solving an issue quickly trumps having a spotless process. In these situations, the hook can be skipped by using the Git --no-verify option. This post has been originally published on the Headshift Labs blog and is reposted here with permission. Here in the London office, we use Git as a Version Control System and Capistrano to manage deployments for almost all our projects: not only Rails, but WordPress and Drupal as well. It’s a well tested tool and the development team has definitely benefited from having a unified way of deploying – regardless of the project language or the server. As an aside, we already posted about VCS and Git in the past, so if you need an introduction you can head to that post, which despite being a couple of years old is still relevant. The setup for the most basic applications usually involves two servers: a staging server and a production server. The staging server is used to show the application to the client and as a testbed to get them to accept user stories, while the production server hosts the real thing. To cater for this scenario, we need to install the Capistrano Multistage Extension, which will allow us to create different deployment recipes for different servers. We are not yet done, however: all the recipes are based on the master branch, which gives us very limited flexibility: we can only deploy what is on the HEAD of master at the time of running our cap deploy command. In a fast-moving project, with multiple developers working at the same time, it’s very unlikely that this will be what we want. We need more granular control on what we’re deploying. To achieve this goal, we can create two Git remote branches: staging and production. We can then update the Capistrano configuration so that the recipe for the staging server will deploy the code committed to the staging branch, and the one for the production server will deploy the production branch. This gives us fine grained control over what is deployed: we can merge the master branch into staging to get the latest changes, or just merge a subset of commits, or cherry pick the ones we want. Running cap staging deploy will then transfer to the server only the commits we selected. If you know your Git, you’ll notice some of the commands are presented in their more verbose form. This is meant to make them safer, but if you know what you are doing you may as well just use git push and git pull. The same goes for rebasing, which is a topic worth a post all by itself. It could be argued that forcing developers to go through the steps each time creates a useful barrier to prevent people from deploying without first thinking about it. On the other hand, it’s a rather long list of commands for a routine task, so it’s a perfect candidate for automation if you trust developers with deploying only when it’s needed. This is not a fancy workflow and it requires a very minimal setup. It could be seen as standing in between very lean workflows as the one used by GitHub and more structured ones as the gitflow model. It’s not by any means the only workflow we use for our projects, but it’s common enough and it has worked successfully for a number of projects. Recently we had to add support for mobile devices to a Rails application we developed. We decided to go with the excellent suggestion we found in the Railscast about Mobile Devices. The gist of it is to add a method to the ApplicationController to set the mime-type to :mobile whenever the request user-agent is recognised as a mobile browser (see the corresponding ASCIIcast for the full code). Given the importance we give to BDD and TDD, however, this only gets you halfway on the road towards a proper implementation: testing for the mobile version of the application is still missing. The most straightforward way to test the application using Cucumber is to make sure the test request headers include a user-agent string, thus mimicking a mobile device. There are a couple of tutorials out there on how to do this (all pointing to comments for a blog post that has now disappeared without a trace). They provided a good foundation to start from, but ultimately we found out there’s an easier way to do it. The core of this solution is a handful of lines, adding support for custom headers to Capybara’s default rack_test driver. The following code will make an add_headers method available to your steps. Now that the basic support is in place, we can write some steps to make our life easier. "Android" => "HTC_Eris Mozilla/5.0 (Linux; U; Android 4.0; en-ca; Build/GINGERBREAD) AppleWebKit/528.5+ (KHTML, like Gecko) Version/3.1.2 Mobile Safari/525.20.1"
Notice that, for the sake of brevity, I’ve included only a couple of user agents in the SAMPLE_AGENT_STRING hash. You can find lots more around the Web. This time my experiments went towards a more intimate direction, no doubt thanks to the little playing around I had with my new M-Audio MIDI keyboard. The rain is a sound effect coming from here. Tapping into the advices of a couple of knowledgeable friends, I’ve remixed my last track to make it sound a little less tinny and cold and empty. I’m fairly happy with the improvements: there’s definitely more of a beefy sound to it now. I also played a bit with panning, which is something best noticed when listening with earphones. All in all, there’s still miles to go before I’m fully satisfied with these tracks, but I’m learning a lot by creating them. I worked on this track for a very long time. It all started with an older experiment: it was a track with two rhythmic and melodic ideas in it, but after a while I realized they did not fit well together. So I nicked one of the ideas from the old track and built a new track around it. When composing this one, I wanted to experiment with time signature changes: as it turns out, the main challenge was not to imagine different time signatures, but to make the transition from one to the other as smooth as possible. Most of the time I spent on this track was on post processing and mixing. I think it’s better than the previous tracks in this respect, but it still lacks something. The difference between listening with earplugs and with my MacBook speakers is especially unnerving, with the latter sounding exceedingly empty and tinny. This track is released under a Creative Commons Attribution-ShareAlike license. Here it is, my second musical creation. It has begun as a nocturnal playing around with some chords and ended up a complete piece in less than one day. As one can surmise from the title, this is a dreamy piece, built around piano arpeggios and some synths. As usual, I’m releasing it under a Creative Commons Attribution-ShareAlike license. Lately I’ve been willing to experiment with music, so I installed Music Studio on my iPad and started trying out things. At first it was mostly random stuff, but with time I managed to craft something that sounds consistent, so here it is. For the most part I’ve worked on this track while flying around on planes or waiting in airports, hence the title. The track was composed with Music Studio and post-processed with GarageBand (which sports slightly less cheesy soundbanks). I’m releasing it under a Creative Commons Attribution-ShareAlike license.